Welcome to Alumni Spotlight, a blog series focused on our alums – where they’ve been and where they are now. 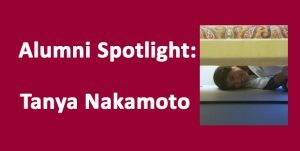 For this installment we interviewed Tanya Nakamoto. Checking my work when sewing a textile piece to its mount. I completed the MSc in Conservation Practice at Cardiff University in 2016. Before the MSc, I got a BA in Anthropology from San Francisco State University where I studied abroad for a year at Cardiff. Afterwards, I had no idea what conservation was yet, but I knew I wanted to work in museums with material culture and art, and preferably in the UK since I loved my year abroad so much. I looked into Cardiff University and found the perfect program for me! For a little over a year now, I have been working as a conservation technician at a private conservation practice in San Francisco where I work with a wide range of materials and situations specific to clients’ needs. I still feel like a recent graduate with my career having just barely begun! During my last few months on my student visa I spent some time applying to museum and conservation jobs in the UK, and I even got a few interviews, but that pesky work visa sponsorship is quite a challenge to get. When I first returned to California I began volunteering in San Francisco’s California Academy of Sciences where I am still a docent to this day. Both my degrees come in handy at the Academy where I handle teaching specimens such as animal skulls and pelts, while interacting with the public about topics such as evolution and environmental changes that affect ecosystems. Yes! The private sector has been my main source of work as a contract conservation technician at a private practice in San Francisco called Art Conservation de Rigueur (ACdR.) 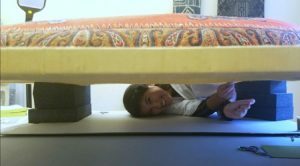 It has been great to work with a variety of objects while also learning how to conserve, store, and display other types of art such as textiles and paintings. Working in the private sector is interesting because you have direct communication with those who view and value the pieces you conserve—and that value can often be more intangible than monetary. This can be rewarding when conservation is completed, or sometimes frustrating when the client’s desires do not reflect what may be the best conservation treatment. 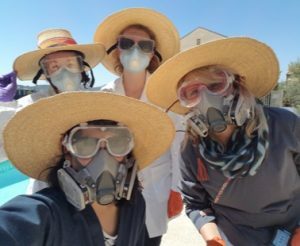 However, it is wonderful to work with a wide range of materials in a smaller scale work force where everyone can troubleshoot together and learn from each other, be it pre or post conservation degree. Thanks to good connections with insurance and disaster recovery specialist companies, ACdR is often referred to clients who need a conservator due to mold, fire, and other disaster scenarios. This has led to some interesting projects with a range of health and safety precautions. 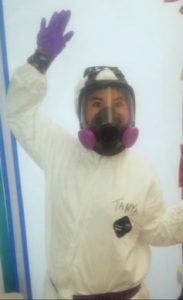 I have assisted in the cleaning and documenting of objects and art in full hazmat suits in positive and negative air pressurized rooms, as well as assessing hundreds of contaminated objects in the California sun—complete with sun hat and PPE. Hats kindly given to us by the client for our assessment. The degree I received from Cardiff has made me comfortable in my ability to handle objects and varying materials. It has made me feel assuredly capable of assessing objects and art I come across, even if I have not worked on that specific material before, to formulate routes for treatment and care. As someone who came in without any prior conservation knowledge or experience, I am grateful to the Cardiff program for nurturing my interests and making me feel confident that I can pursue a career in the field of conservation. I have come to learn that not every program is so hands on straight away. The fact that Cardiff’s program is very hands on really helped me learn, especially when studying some of the chemistry I never thought I’d understand, in a visual and accessible way. I also love that the theoretical aspects of conservation are also studied and discussed concurrently with scientific analysis. The only thing I would want to change would probably be to see more support given to the lecturers and program by the University. Do you still use and update a portfolio? Have you found that it makes a difference in your job opportunities? I have not been very good at updating my portfolio while being out of the job hunt. However, I continue to collect photos and take notes for my future updated portfolio. I have found that it is useful to have a portfolio for interviews, as well as for networking, as a way for people to really see your skills and to start a dialogue. The only other thing I can think to mention is to just be aware what is required of you if you are searching for a job outside of the UK. It is easier to pick up on what might be necessary when job hunting in the UK while living there, but those tips might not be applicable in your home country should you return. Most incoming students probably know what it’s like to find a job in their home country, like in U.S.A for example, but some might not realize how the competition differs and what they can do while they are in Cardiff to keep up with that hustle when they get home. Thank you to Tanya again for taking time out of her schedule to chat with us. Great pointers for job hunting and view into the private sector!